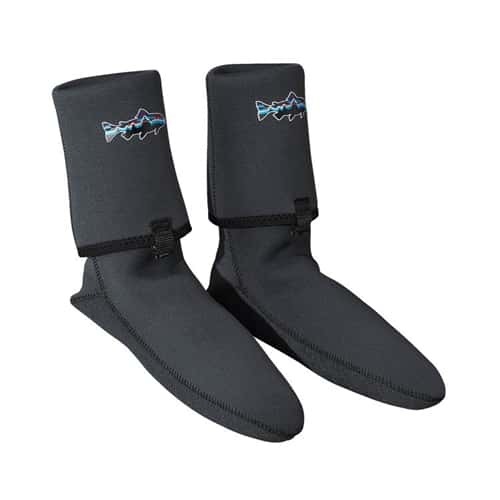 The Patagonia neoprene socks with built in gravel guards are very useful when you don't want to wear waders but you'd like to wear your wading boots. 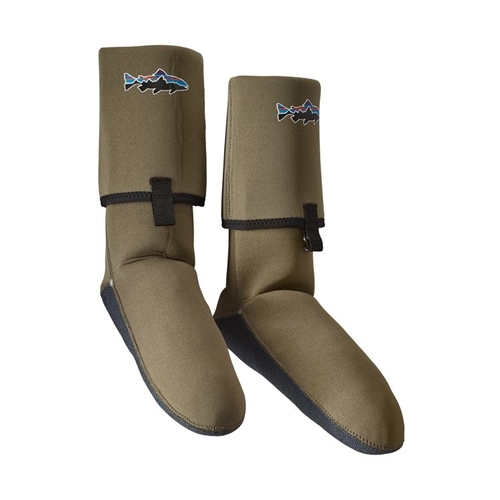 When worn with fly fishing wading boots, these neoprene socks will prevent gravel from getting in to your boot. Made of 100% nylon upper and 95% nylon/5% spandex footbed. On hot days – especially if hiking’s involved – there’s nothing better than wet wading in cool water. Except when rocks get in your boots and your toes freeze. Our new Neoprene Sock with Gravel Guard solves both problems, allowing you to fully enjoy the experience. A soft, stretchy 3.5-oz neoprene upper cushions and insulates, while the dense neoprene sole resists abrasion and compression. Gravel guards fold down and attach securely to laces with built-in hooks. And to complete your wet-wading mojo, there’s a sweet Fitz Roy trout logo swimming across the top front of each gravel guard. The Patagonia Gravel Guard Socks are excellent for wet wading when the water is shallow and cold and the air is hot... These are a high value product and were sized properly to fit inside my daughter's wading boots and are very comfortable. They will fill the wading boot like the neoprene booties on your waders, keeping the fit similar, but are tighter at the top, being designed to allow water in, but keep gravel out.